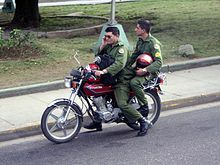 The Cuban Revolutionary Armed Forces (Spanish: Fuerzas Armadas Revolucionarias – FAR) consist of ground forces, naval forces, air and air defence forces, and other paramilitary bodies including the Territorial Troops Militia (Milicias de Tropas Territoriales – MTT), Youth Labor Army (Ejército Juvenil del Trabajo – EJT), and the Defense and Production Brigades (Brigadas de Producción y Defensa – BPD), plus the Civil Defense Organization (Defensa Civil de Cuba – DCC) and the National Reserves Institution (Instituto Nacional de las Reservas Estatales – INRE). The armed forces has long been the most powerful institution in Cuba. The military manages many enterprises in key economic sectors representing about 4% of the Cuban economy. The military has also served as Raúl Castro's base. In numerous speeches, Raúl Castro emphasized the military's role as a people's partner. From 1966 until the late 1980s, Soviet Government military assistance enabled Cuba to upgrade its military capabilities to number one in Latin America and project power abroad. The first Cuban military mission in Africa was established in Ghana in 1961. Cuba's military forces appeared in Algeria, in 1963, when a military medical brigade came over from Havana to support the regime. Since the 1960s, Cuba sent military forces to African and Arab countries – Syria in 1973, Ethiopia in 1978, the Cuban intervention in Angola from 1975 to 1989, and Nicaragua and El Salvador during the 1980s. The Soviet Union gave both military and financial aid to the Cubans. The tonnage of Soviet military deliveries to Cuba throughout most of the 1980s exceeded deliveries in any year since the military build-up during the 1962 Cuban Missile Crisis. In 1989 the government instituted a cleanup of the armed forces and the Ministry of Interior, convicting army Major General and Hero of the Republic of Cuba Arnaldo Ochoa, Ministry of Interior Colonel Antonio de la Guardia (Tony la Guardia), and Ministry of Interior Brigadier General Patricio de la Guardia on charges of corruption and drug trafficking. This judgment is known in Cuba as "Causa 1" (Cause 1). Ochoa and Antonio de la Guardia were executed. Following the executions, the Army was drastically downsized, the Ministry of Interior was moved under the informal control of Revolutionary Armed Forces chief General Raúl Castro (Fidel Castro's brother), and large numbers of army officers were moved into the Ministry of Interior. Cuban military power has been sharply reduced by the loss of Soviet subsidies. Today, the Revolutionary Armed Forces number 39,000 regular troops. The DIA reported in 1998 that the country's paramilitary organizations, the Territorial Militia Troops, the Youth Labor Army, and the Naval Militia had suffered considerable morale and training degradation over the previous seven years but still retained the potential to "make an enemy invasion costly." Cuba also adopted a "war of the people" strategy that highlights the defensive nature of its capabilities. On September 14, 2012, a Cuban senior general agreed to further deepen military cooperation with China during a visit to Beijing. He said that Cuba was willing to enhance exchanges with the Chinese military and strengthen bilateral cooperation in personnel training and other areas. Vladimir Putin inspecting the Army Guard of Honour at the Palace of the Revolution in Havana in 2014. In 1984, according to Jane's Military Review, there were three major geographical commands, Western, Central, and Eastern. There were a reported 130,000 all ranks, and each command was garrisoned by an army comprising a single armoured division, a mechanised division, and a corps of three infantry divisions, though the Eastern Command had two corps totalling six divisions. There was also an independent military region, with a single infantry division, which garrisoned the Isle of Youth. A U.S. Defense Intelligence Agency assessment in the first half of 1998 said that the army's armour and artillery units were at low readiness levels due to 'severely reduced' training, generally incapable of mounting effective operations above the battalion level, and that equipment was mostly in storage and unavailable at short notice. The same report said that Cuban special operations forces continue to train but on a smaller scale than beforehand, and that while the lack of replacement parts for its existing equipment and the current severe shortage of fuel were increasingly affecting operational capabilities, Cuba remained able to offer considerable resistance to any regional power. In 1999 the Revolutionary Army (Ejercito Revolucionario) represented approximately 70 percent of Cuba's regular military manpower. According to the IISS, the army's estimated 45,000 troops including 6,000 active and 39,000 members of the Ready Reserves who were completing the forty-five days of annual active-duty service necessary for maintaining their status, as well as conscripts who were fulfilling their military service requirement. The IISS reported in 1999 that the army's troop formations consisted of four to five armored brigades; nine mechanized infantry brigades; an airborne brigade; fourteen reserve brigades; and the Border Brigade. In addition, there is an air defense artillery regiment and a surface-to-air missile brigade. Each of the three territorial armies is believed to be assigned at least one armored brigade-usually attached to the army's headquarters-as well as a mechanized infantry brigade. As well, it is known that the Border Brigade in Guantanamo and at least one ground artillery regiment (attached to a mechanized infantry brigade), based in Las Tunas, are under the Eastern Army's command. In 1996, according to Jane's Information Group, the army was organized into three Territorial Military Commands with three Armies, one army for each command. At the time, there were an estimated 38,000 army personnel. 78th Armored Division "Sanguily Rescue"
APS underwater rifle Underwater Assault Rifle Used by special forces. SKS Semi-automatic carbine Mostly limited to use as a ceremonial weapon. PM-63 RAK Poland Sub-machine gun used by some MTT units. Possibly captured sometime during the Cold War. BTR-60 Various versions of this vehicle. Including one with a 100 mm gun and a modified T-55 turret. D-30 Mostly used as guns for Self-Propelled Artillery together with modernized A-19 122 mm. M-30 Used as saluting guns firing 21-gun salutes. M-46 This 130 mm long range gun is used also as a Self-Propelled Artillery Piece in 6x6 truck called Jupiter-V and there is also a version mounted on a T-34 chassis. S-75 Dvina Soviet Union 25 On T-55 chassis. S-125 Neva/Pechora On T-55 chassis. This missile was seen in the Cuban Military Parade of 2006. CIA map showing the estimated range of Cuban MiG-29 Fulcrum jets. In the 1980s, Cuba with the help of the Soviet Union was able to project power abroad, using its air force, especially in Africa. During that time Cuba sent jet fighters and transports for deployment in conflict zones such as Angola and Ethiopia. In 1990, Cuba's Air Force was the best equipped in Latin America. In all, the modern Cuban Air Force imported approximately 230 fixed-wing aircraft. Although there is no exact figure available, Western analysts estimate that at least 130 (with only 25 operational) of these planes are still in service spread out among the thirteen military airbases on the island. In 1996, fighters from the DAAFAR shot down two Cessna aircraft based in Florida which were incorrectly suspected of dropping leaflets into Cuban airspace. The air force was criticised for not giving the pilots of the aircraft options other than being shot down. One aircraft escaped. In 1998, according to the same DIA report mentioned above, the air force had 'fewer than 24 operational MIG fighters; pilot training barely adequate to maintain proficiency; a declining number of fighter sorties, surface-to-air missiles and air-defense artillery to respond to attacking air forces. By 2007 the International Institute for Strategic Studies assessed the force as 8,000 strong with 41 combat capable aircraft and a further 188 stored. DAAFAR is known now to have integrated another MiG-29 and a few MiG-23s which makes it 58 combat aircraft in active service which are listed as 6 MiG-29s, 40 MiG-23s, and 12 MiG-21s. There were also assessed to be 12 operational transport aircraft plus trainers which include 8 L-39C and helicopters which are mainly Mil Mi-8, Mil Mi-17 and Mil Mi-24 Hind. Raúl Castro ordered in 2010 that all MiG-29 pilots had to have full training, they now have from 200–250 hours of flight annually together with real dogfight training and exercises. Up to 20 MiG-23 units also have this kind of training but the other 16 MiG-23 units spend more time in simulators than real flight. MiG-21 units have limited time in these training exercises and spend more time in simulators and maintain their skills flying with the commercial brand of the air force Aerogaviota. At San Antonio de los Baños military air field, south west of Havana, several aircraft are visible using Google Earth. In 1988, the Cuban Navy boasted 12,000 men, three submarines, two modern guided-missile frigates, 1 intelligence vessel, and a large number of patrol craft and minesweepers. However, most of the Soviet-made vessels have been decommissioned or sunk to make reefs. By 2007, the Cuban Navy was assessed as being 3,000 strong (including up to 550+ Navy Infantry) by the IISS with six Osa-II and one Pauk-class corvette. The Cuban Navy also includes a small marine battalion called the Desembarco de Granma. It once numbered 550 men though its present size is not known. After the old Soviet submarines were put out of service, Cuba searched for help from North Korea's experience in midget submarines. North Korean defectors claimed to have seen Cubans in mid to late 1990s in a secret submarine base and appeared in public view years later a single picture of a small black native submarine in Havana harbour. It is rumored to be called 'Delfin' and is to be armed with two torpedoes. Only a single boat is in service and the design appears original, even if influenced both by North Korea and Soviet designs. The Cuban Navy rebuilt one, large ex-Spanish Rio Damuji fishing boat. BP-390 is now armed with two C-201W missiles, one twin 57 mm gun mount, two twin 25 mm gun mounts and on 14.5 mm machine gun. This vessel is larger than the Koni class, and it is used as a helicopter carrier patrol vessel. A second unit (BP-391) was converted and entered service in 2016. The Cuban Navy today operates its own missile systems, the made-in-Cuba Bandera (a copy of the dated Styx Soviet missiles) and Remulgadas anti-ship missile systems, as well as the nationally produced Frontera self-propelled coastal defence multiple rocket launcher. The navy's principal threats are drug smuggling and illegal immigration. The country's geographical position and limited naval presence has enabled traffickers to utilise Cuban territorial waters and airspace. The Cuban Navy's air wing is an ASW helicopter operator only and is equipped with 2 MI-14 Haze helicopters. 2 Rio Damuji-class frigates, 1 × 57 mm gun, 2 Styx surface-to-surface missiles, 1 × 12.7 mm machine gun, 2 × 25 mm machine guns. 1 Delfin-class midget submarines, possibly 2 torpedo launchers. Rumored derived from North Korean Yugo-class submarine. 1 Pauk II-class fast patrol craft, Coastal with 1 × 76 mm gun, 4 anti-submarine torpedo tubes, 2 anti-submarine weapon rocket launcher – 495 tons full load – commissioned 1990. 6 former Soviet Union (FSU) Osa II-class PFM missile boats; 13 Type II transferred. 3 ex-Soviet Union (FSU) Sonya-class minesweepers; 4 transferred. 5 Former Soviet Union (FSU) Yevgenya-class minesweeper; 11 transferred. ≈10 SSC-3 surface-to-surface missile systems. ^ "The Cuban military and transition dynamics" (PDF). ^ "Does the Cuban Military Really Control Sixty Percent of the Economy?". Huffington Post. ^ "Challenges to a Post-Castro Cuba" (PDF). Harvard International Review. ^ a b Carl Gershman and Orlando Gutierrez (January 2009). "Can Cuba Change?" (PDF). Journal of Democracy. 20 (1). ^ Claudia Zilla. "The Outlook for Cuba and What International Actors Should Avoid" (PDF). ^ English, Adrian J., "The Cuban Revolutionary Armed Forces," in Ian V. Hogg (Ed. ), Jane's Military Review, Jane's Publishing Company, 1985. ^ " "The World Factbook". Retrieved 24 April 2016. ^ a b "About this Collection" (PDF). The Library of Congress. Retrieved 24 April 2016. ^ "Cuban Armed Forces Review: Territorial Military Commands". Archived from the original on 12 January 2008. Retrieved 24 April 2016. ^ a b "Armies of the world Arsenal". Retrieved 24 April 2016. ^ a b c "Cuban Tanks". Cuban Aviation • Rubén Urribarres. Retrieved 24 April 2016. ^ a b "Delfin". hisutton.com. 10 October 2016. Retrieved 4 January 2018. ^ "Global Security on Cuban Navy". ^ Cuban Armed Forces Review: Air Force Archived 2009-02-10 at the Wayback Machine. ^ "Zhuk class". Retrieved 9 December 2012. ^ "Cuban Border Guard". Retrieved 9 December 2012.